Friday, March 31, 2017 will go down as a momentous day in Jamaican history. 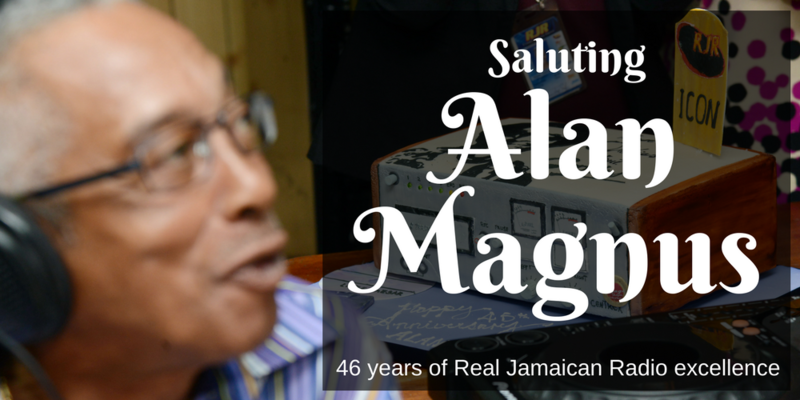 After 46 years of being ‘The Morning Man’ and winning the hearts of Jamaicans both home and abroad, Alan Magnus stepped away from the radio broadcasting stage. After raising the bar for morning shows with his quick wit and infectious personality, he dropped the proverbial mic in what could be deemed a challenge to his successors to continue his stellar legacy. But what was Alan Magnus’ life like before he met and fell in love with radio announcing at RJR? Here are some little-known details. 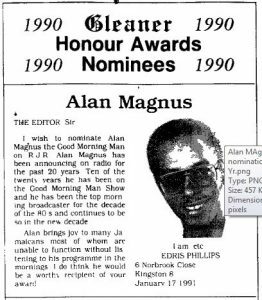 Before Alan Magnus went to RJR in 1971 to moderate programmes like Best By Request, Top of the Pops, the Night Hawk Show and Variety Showcase, he was already involved in music. During his time as a student at Kingston College, he teamed up with a friend to form a vocalist duo called ‘Videos’. They impersonated the Everly Brothers and placed second in one of the RJR Vere Johns Opportunity Hour Shows in 1959. When he left high school, he was one of the founding members of the Vikings Band, and stayed with them for two years as a rhythm guitarist and MC. Then he left the island to study electrical engineering in England for three years, returning to work with the Jamaica Telephone Company. He couldn’t stay away from music, and found himself working as a radio announcer with RJR. A Gleaner article described his debut as “something warm stimulating and exciting”, portending his bright future on radio. Another in 1990 noted his nomination for the paper’s Man of The Year Award after nearly two decades on radio. It was the beginning of a legacy of camaraderie and trust with local radio listeners. Who would have thought that 46 years later, so many Jamaicans would have literally ‘grown up’ on the sound of that voice every morning? Alan Magnus is truly a national treasure.